California YMCA Youth & Government is an umbrella organization which operates the following programs: Model Legislature &Court (ML/C), Spring Conference, Conference On National Affairs (CONA), and National Mock Trial Court all for high school students (grades 9-12), and the Model United Nations (MUN) for middle school students (grades 6-8). The Youth & Government program is a six-month program in which high-school aged delegates (9th-12th grades) learn about California’s government and the changes they can make in their communities. Students will role-play various positions of the California State Legislature and the State Court systems. Students participate by joining their high school delegation and attending weekly meetings where they discuss issues facing California and the ways the legislative and judicial branches can effect change. 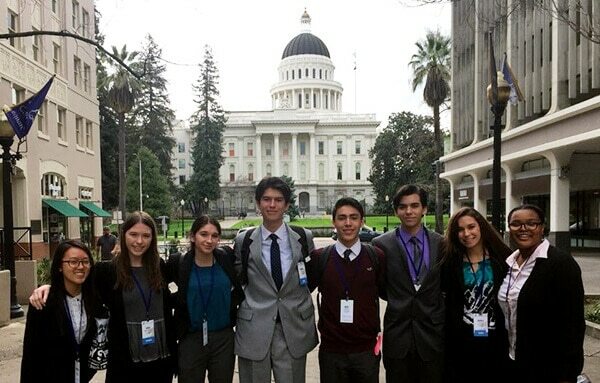 California YMCA Youth & Government’s Model Legislature & Court (MLC) has been the state’s premier youth leadership and civic development program since 1948. The MLC creates a six-month learn-by-doing experience that teaches the values of democracy by bringing together a cross-section of the state’s high school students. This program provides them with the opportunity to experience government first-hand and to learn how to solve community problems through the democratic process as well as debate and discuss issues with their peers from throughout California. The YMCA Youth & Government Model United Nations program is a simulation of the “real-life” United Nations. Ambassadors will research, debate and establish policies, treaties and resolutions focusing on international issues, including disputes between countries, peace-keeping responsibilities, border crisis, stabilizing financial markets and dealing with hunger, disease and poverty. Delegations are assigned one or more countries (depending on the number of Ambassadors) that they will represent, and the Ambassadors will research the countries and come to the MUN as representatives of those countries. Ambassadors can be a part of one of several entities (known as “organs”) that make up the U.N., including the General Assembly (GA), Security Council (SC), International Court of Justice (ICJ), Economic and Social Council (ECOSOC), International Press Corps IPC), Non-Governmental Organizations (NGO), and the Secretariat (for High School interns only). Ambassadors write, debate and vote on resolutions in the GA, ECOSOC, or SC, hear memorials (court cases) dealing with issues of human rights, settling border or territorial disputes in the ICJ, or investigate, research, interview, and then write newspaper articles for the International Press Corps. Some Ambassadors may also be faced with some “crisis” issues that they will be asked to resolve as well.